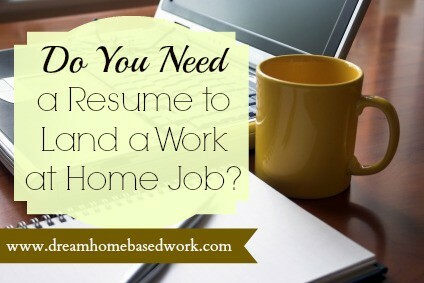 Home » Latest from the Blog » Work from Home » Advice and More » Do You Need a Resume to Land a Work at Home Job? This question has been asked by so many people and depending on people’s opinion, different answers have been provided. However, the most suitable answer for the question asked above is YES. Even if so many beg to differ, a resume is very important. As a matter of fact, a well written resume is a must if you must land a work at home job. This is because people who want to hire you have a lot of prospective employees in mind and only your resume will make you stand out from others. Your employers will not consider you for employment if you do not have a resume that tells them more about you and how you can help them. As a work at home Mom or Dad, your interviews will be held either by mail or on the phone and your resume is the first thing your employer needs to know more about you. Your well written resume will tell your employers more about your strengths and why they need to hire you. Most employers who want to hire you for a stay at home job may not have the time to schedule an interview and so your resume is the only thing you need to make a long lasting impression in the heart of your prospective employers. You must however note that writing a resume for a home based job is very different from writing a resume for an onsite job. Most home based workers make a lot of mistakes while writing their home based job resume. Here are 3 big mistakes most people make while writing their home resume and how you can fix yours if you have ever made any. 1. Sending an unexciting resume: One mistake that people who write home based job resumes make is that, they send boring resumes. You should always bare it in mind that a lot of people are applying for that home based job you are interested in and so you need to do all you can to stand out of the crowd. Try to use active verbs to describe your skills. For instance, if you are very fast at typing, do not make the mistake of saying “I am fast at typing”. A very good way to describe this skill is to say “I can type 100-words in 60 seconds”. 2. Using the same resume for every job: This is a mistake you must avoid when writing a resume for your home based job. Even if the companies you are applying to are in the same industry, you should ensure that you create your resume to the job specification of each company. You must also ensure that your resume is well organized in a way that showcases your talents and expertise the way the organization wants it. You should also ensure that your use of language is the same as the way it is used in each company. 3. Including Irrelevant details: Another mistake that most people make when writing a Resume for a work at home job is that they include details that are not relevant. Most employers do not need to know about your marital status or economic status. Another mistake you should avoid is that you should not place too much on your years of experience. Your prospective employers can see this by going through your work history. Your hobbies should not be highlighted but if the hobbies relate to the skills needed to be considered for employment, they can be listed. You should always remember that the reason why you need a resume for a home based job is to showcase your skills and experience that would make your employers consider you and so any other information is not too relevant. As a work at home mom or dad, there is only one item that makes employees want to hire you and that is your resume. A well written resume will distinguish you from the crowd and get you hired in the end. Need More Help? Read “Create a Work from Home Resume that Get's You Hired” from Work from Home Happiness. Thanks for your article, Lashay! It is so important to write a good and “selling” resume, especially these days when each of has to face a stiff competition. If you don’t mind, I would add a tip from myself. It’s not my invention, actually I’ve read it at this article https://collegepuzzle.stanford.edu/?p=5410 . The tip is: accept the fact that a “robot” will probably be the first to see your resume. There’s a lot of big companies that use Applicant Tracking System, that usually stands on the way of a good but negligently written resume, so that the employer may not even look throw it because of the ATS blocks your resume.